Navajo President: Go To College, Then Bring That Knowledge Home Half of Native Americans say college was never part of the conversation growing up. Their graduation rates are far below the national average. Navajo leaders say those who go to college don't return. Tommy Rock received his Ph.D. from Northern Arizona University in the School of Earth Science and Environmental Sustainability. Rock grew up in Monument Valley and worked in the tourism industry before going away to college. Tommy Rock has had three graduations — high school, college and graduate school. And no one from his family was there — no one to cheer for him, no one to take his picture. And when he came home to Monument Valley, few really cared. "I didn't get no congratulations or nothing," Rock said. "It was like 'Oh you think you're better than us?' I was like, 'Wow, OK.' "
When a Navajo baby is born, it's custom to bury the umbilical cord in the ground. The Navajo believe that ties the child to the land forever. But a new generation of Navajos are defying this belief as more and more young people leave the Navajo Nation to go to college or to find work. Elders encourage their return, but often that transition home is rough. Almost half of the Navajo Nation is unemployed. After high school there are few opportunities. After Rock graduated from high school, he did what everyone else did in Monument Valley: He worked in the tourism industry. But he had his sights set on college. "One day I just grabbed my bag, started walking, hitch hiked out to the junction and stuck out my thumb," Rock said. "There was a person going back to Prescott." That's where he enrolled as a freshman at Yavapai College. The first semester was hard. The cost of books, housing and food quickly ate up the money he had saved. And no one back home was willing to help him out. So he lived on ramen noodles and Spam. "I used to weigh like [180 to 185] or so," Rock said. "And by the end of the semester my first semester I dropped down to 140." People like Rock are part of the Navajo brain drain, said Navajo President Russell Begaye. Begaye, himself a graduate of the University of California Los Angeles, made a plea in his inaugural address to the thousands of Navajo who have seen their children and grandchildren leave the reservation for school and then head to Phoenix, Los Angeles or Albuquerque to work. "Their brains and their skills and expertise are being utilized to help grow those towns and cities," Begaye said. "It is time we bring them back." Begaye said that starts at home. Forty-nine percent of Native Americans say applying to college was never part of the conversation growing up, according to a poll by NPR, the Harvard T.H. Chan School of Public Health and the Robert Wood Johnson Foundation. Not talking about college leads to few college graduates. One in 10 Native Americans have their bachelor's degree, according to the U.S. Census Bureau. In the general population that number is closer to one-third. 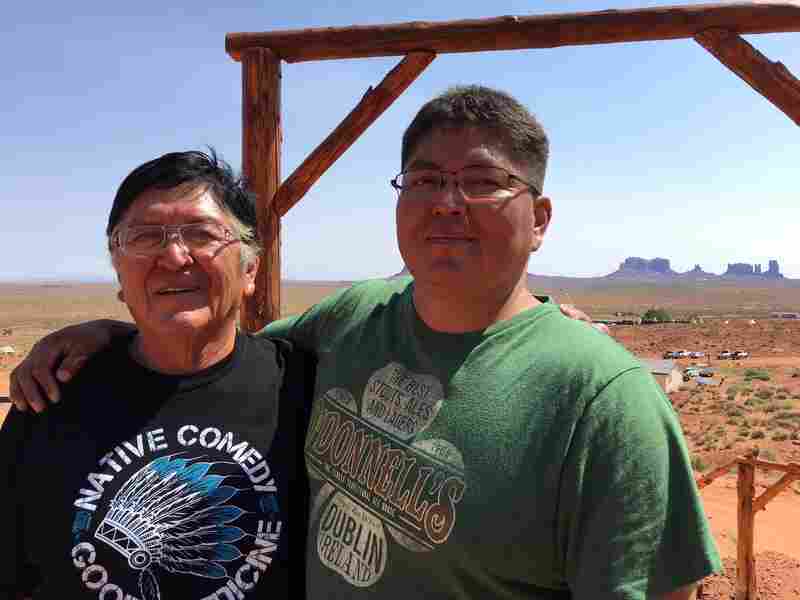 Tommy Rock's uncle, Gary Holiday (left), says he was treated like an outcast after he left the reservation to get his bachelor's and master's degrees in Salt Lake City. Tommy Rock's uncle Gary Holiday is the one relative who has supported Rock and he wished he could have been at his college graduation. "I value education," Holiday said. "I was the first one in my family to finish high school. My mother never spent a day in school. My father was in the military." Holiday went to Salt Lake City to get his bachelor's and master's degrees in social work. Like so many Native Americans, Rock and his uncle had to navigate the world of higher education without much help from family. And Rock said there's an idea in Navajo that speaks to his situation. "No one's going to do it for you," Rock said. "You have to do it for yourself." That he did. 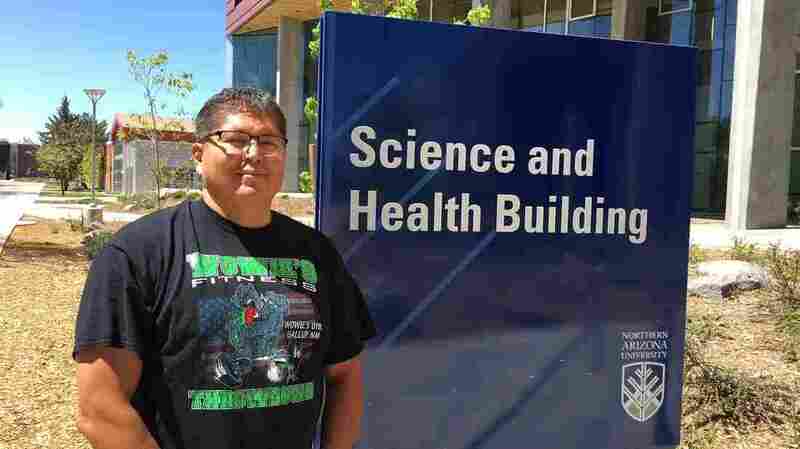 In December Rock earned his Ph.D. in environmental science from Northern Arizona University. And now he's devoting himself to the Navajo Nation, where he's working to clean up uranium contamination.